Together with most modern electronics and computer technology (developed and manufactured in Germany) the basic knowledge of holistic medicine served as a foundation for the development of the professional Biopulsar Analysis System Biopulsar-Reflexograph®for a Biofeedback measuring of the reflex zones. 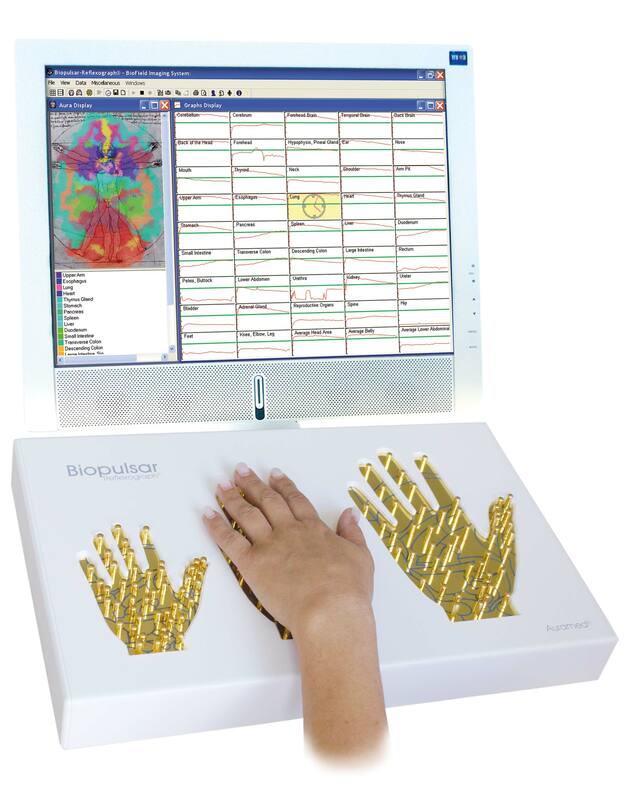 Each Biopulsar Analysis system consists of a Biofeedback sensor and a software package. For operating functions a PC or notebook with Windows™ XP / 7 /8 or 10 as operating system and a printer are required. The biofeedback sensors as well as the corresponding software programmes are built up in modules. The packages can be arranged according to your individual needs and upgraded any time. We offer Biofeedback sensors with one or more different hand sizes – for the left as well as for the right palm. On a biofeedback sensor there are one or several hand templates in different sizes in the shape of the palm. Biomedical measuring electrodes are positioned on each hand template. The measuring electrodes are positioned on those markings that correspond to the organ reflex zones of the palm and fingers. They are arranged in different lengths according to the anatomy of the hand. The palm to be measured has to be placed on the fitting template. Then specific biofeedback parameters are measured from the reflex zones every 500 milliseconds (real time). Most modern electronics process these data at high speed and transfer them to the PC. Various software modules are delivered with the biofeedback sensor. They offer different possibilities of presentation and evaluation of the measured Biofeedback data.